Formulated for physically active dogs that require a sustained level of endurance. SPORTMIX® Stamina Adult Mini Chunk is a nutrient-rich formulation with selected high quality ingredients combined with vitamins and minerals which promote strong muscles and bones, and glossy coat. 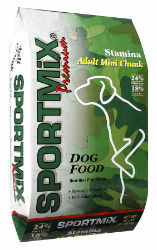 SPORTMIX® Stamina Adult mini Chunk is highly palatable; your dog will love the hardy taste. The optimum protein and fat level helps promote extra energy, vitality and endurance needed for overall good health and staying power. SPORTMIX® Stamina Adult Mini Chunk supplies your dog with a naturally preserved, 100% complete and balanced diet for a healthy active life. A standard 8 ounce measuring cup holds approximately 3.9 ounces of SPORTMiX® Stamina Adult Mini Chunk. SPORTMIX® Stamina Adult Mini Chunk may be fed dry or moistened according to your dog's preference. If moist food is preferred, mix 4 parts SPORTMIX® Stamina with 1 part water, milk, or broth. Use the chart as a guide. One feeding per day is acceptable; however, two feedings each of one half of the daily requirement is recommended. Puppies may be started on SPORTMIX® Stamina as soon as they are old enough to take solid nourishment. Feed your puppy a mixture of 2 parts Stamina with 1 part warm liquid until the puppy is 2 months old. After 2 months, feed your puppy all it will eat in a 20 minute period, 4 to 5 times a day, gradually reducing to a single daily feeding by one year of age. Lactating dogs require two to three times as much food as adult dogs. Remember, these amounts are averages and will vary depending upon the breed, size and age of your dog. Have clean fresh water available at all times. Meat Meal, Ground Yellow Corn, Chicken Fat (preserved with mixed Tocopherols), Wheat Flour, Rice Bran, Corn Gluten Meal, Dried Beet Pulp, Salt, Brewer's Dried Yeast, Potassium Chloride, Choline Chloride, Vitamin A Supplement, Vitamin D3 Supplement, Vitamin E Supplement, Zinc Sulfate, Ferrous Sulfate, Niacin, Calcium Pantothenate, Riboflavin Supplement, Copper Sulfate, Pyridoxine Hydrochloride, Thiamine Mononitrate, Manganese Sulfate, Zinc Proteinate, Manganese Proteinate, Copper Proteinate, Calcium Iodate, Cobalt Carbonate, Folic Acid, Sodium Selenite, Biotin, Vitamin B12 Supplement.